The cost of bailing out AIB has gone up an additional €280m, after the bank was once again unable to pay interest on government rescue loans. The bank said it expects to miss a deadline to pay the bill in cash which falls due in less than three weeks. Instead, the bank said new ordinary shares will be handed over to settle the bill. The Government already owns more than 99pc of the bank after a €20bn bailout. The interest is due on a €3.5bn portion of so-called preference shares held by the National Pensions Reserve Fund Commission (NPRFC). AIB said if the annual cash dividend is not settled in cash, it must be settled in ordinary shares. "Following careful consideration of the interests of the bank and its shareholders, AIB has determined that the dividend of €280m, due 13 May 2014, will be settled in ordinary shares in lieu of a cash payment," it said. "As a result AIB becomes obliged to issue and allot ordinary shares to the NPRFC in accordance with AIB's Articles of Association." The NPRFC already holds 99.8pc of the bank's 521 billion ordinary shares, the majority issued at a price of €0.01 per share in July 2011, so the new shares will not materially increase the State's stake in the bank. AIB expects to return to profit in 2014 after making an operating profit of €445m last year when losses on boom-era assets were excluded. But last month it emerged AIB was in talks with the Government that could see the €3.5bn portion of the bank's bailout loans effectively written off this year – by being swapped for still more shares. 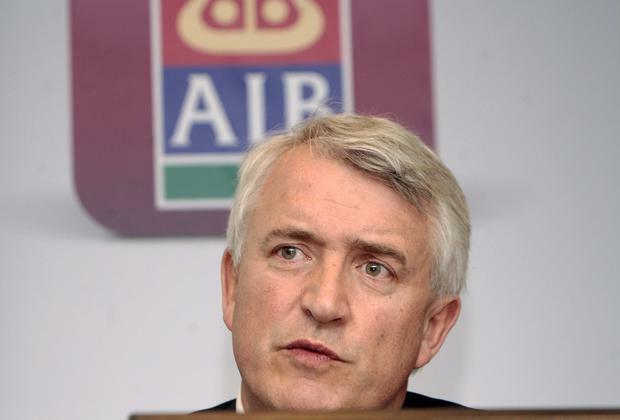 AIB chief executive David Duffy, above, said the state-owned bank was in discussions with the Department of Finance on the issue.